Videowalls are groups of screens that work together to display a single image. If you have two or more screens, a practical application to help you communicate and make an impact. A new multimedia experience. Easy to setup. 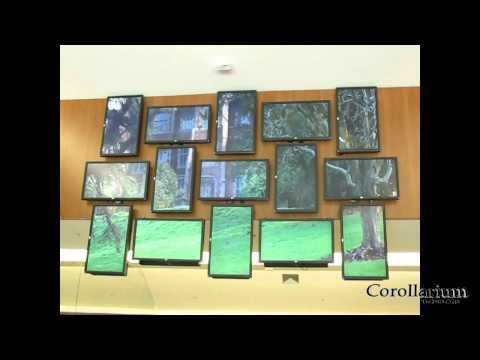 Our videowall software makes several physical screens behave as one big display. Let your creativity flow and arrange your screens in anyway you wish. Different screen sizes, rotated screens. Set it up in minutes with our intuitive interface. Be different. Capture the attention of your audience in events. We include a fully integrated media player. Play images and videos, create multiple playlists straight from your device. Try it for free with up to two screens! If in doubt, download the "full" or "offline" version. Choose the number of cameras/screens that you need and select the desired currency. Copyright © Corollarium. All rights reserved.